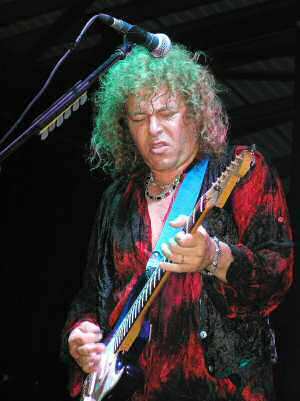 According to Y&T guitar maestro and vocalist Dave Meniketti it’s been 23 years since the band headlined a tour in the UK. If this M1 Motorway has any more roadworks and speed cameras it will take us that long to get to the gig. Those stupid roadworks meant that Avenger were well into their set when we arrived. Celebrating 25 years since they emerged on the NWOBHM train, the UK rockers have put their brand of metal back on track one more time. From what we could hear rumbling through the foundations and into the venue entrance it was still balls to the wall metal and was a reminder of how it used to be back then. Robin Hood’s tales of myths in good old merry England may be just a fairy tale but Dave Meniketti and Y&T are entering the stage to a fantastic roar from a packed Nottingham Rock City and that’s a fact. Open Fire is unleashed and like the beast that it is will have any sceptics running for cover. 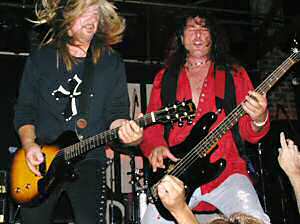 Straight Through The Heart is another gem but it took Dirty Love to finally get the crowd in vocal unison with Y&T. After a very bluesy and tasteful guitar solo from Meniketti it was an opportunity for John Naymann to hold centre stage. Hey this dude is no slouch on the lead guitar either. 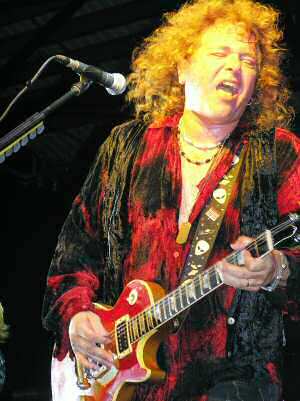 He owned a Les Paul guitar at the age at 15, went on to make a name for himself with Mile Hi,415 and later with the Eric Martin Band ( former Mr Big fromtman and vocalist). He had been hired years ago by Y&T to do background vocals on the Rock We Trust Tour but he’s not in the background any more. Those years as a hired hand did help establish a bond with the band who are performing as a very tight unit this evening. Hurricane just blows every one away and after explaining why Dance, Dance, Dance, was originally Boys Night OutY&T showed why it was a cool night out for all lovers of traditional rock. 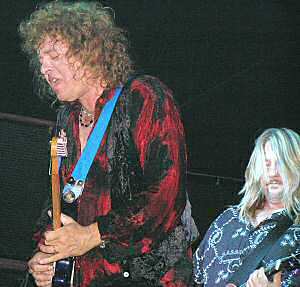 “Winds Of Change” is one of those rock ballads to die for and really opens the door on all that Y&T stand for. There’s more than enough to send the Bailey’s home happy but hold on a minute these guys ain’t even flicked open their back catalogue of classics yet. Rescue Me, Summertime Girls, Midnight In Tokyo, Mean Streak , they are all in there in the Y&T pleasure dome of rock anthems. This is when the penny drops. When you can throw this much quality at a crowd, man it’s going to stick just like the chewing gum on my spanking new trainers. You sometimes think you know what to expect. Ok we plugged “Summertime Girls to death on MTV and started playing Y&T from the early 80’s so know most of what’s on offer right? Wrong! As Dave Meniketti starts a guitar solo on his own we thought “Oh no don’t spoil it with a guitar masturbating experience” but just like Bandi (rockunited team) it was over in a flash and what followed could have been a Parisienne Walk Ways cover. This instrumental was built up around the same sort of chord progression but dare I say that it had more feel and soulful playing than Gary Moore’s epic? Well that will spark off a debate but this was unmistakably for me a superb lesson of playing totally from the heart. This is a far cry from big hooks and sing long ditties we are accustomed to. This is Meniketti in what could have been a vulnerable position. Big guitar solo’s are for wanna be guitarists to admire and a time to get to the bar. Well not tonight. The reason why is this in not just any guitar solo but a conversation, the guitar is asking the question, telling the story and if you are still not sure will give you the answer. Everything from the old school of blues guitar playing is there but it’s like I said to the pizza man “It’s how it’s delivered that counts”. “I’ll Cry For you” paints a completely different picture. The whole venue becomes the canvass as Dave Meniketti turns a bluesy sketch into a master piece. The display on the guitar opened a new interest from me personally as I respected Y&T as a band with great no strings attached songs. However, Meniketti as a guitar hero never entered my head. There’s never been an album that has captured the real Y&T cause they are best seen live so hopefully that song will emerge on a live DVD (or maybe it does. I’m not sure?) It appears on the Contagious album but as he plays it different every night it can only be appreciated on the night so don’t miss Y&T on tour in Europe and beyond back together and as good as it gets as reunions go. We would have loved to have heard one of our favourite songs Contagious so we will find out why it was omitted from the set list when we go backstage so join us there (side menu). Don’t miss Y&T the timeless warriors from the USA! We are immediately introduced to Dave Meniketti in a dressing room packed tighter than the notes in Graham Oliver’s wallet. The first thing we noticed was Meniketti’s manager constantly making sure the band signed bundles of posters for the fans , this is great PR and a great way to show the fans you care. So let’s not fiddle about with the bra strap let’s get everything out in the open! BB's: "Dave, how come you didn’t play Contagious?" BB’S It was cool to see Graham again. During the show he turned round to us and said “The drummer looks like someone out of Emmerdale Farm” (Hit UK TV show). He was referring to Leonard Haze who was named the World’s Fastest Foot in Circus Magazine by fellow skin basher Carmine Appice. He was solid all night and never seemed to break out in to a sweat. He was also responsible for coming up with the name Y&T named after a Beatles album Yesterday And Today. We managed to grab a copy of the new Y&T album from their manager Jill on the way out. It’s the second in Y&T’s Unearthed series. There is unreleased material plus original demos and recordings from 1974 to 1989. This is definitely one for the fans so don’t expect any polished over dubs and production. We love the album sleeve info and the story behind the tracks plus the inlay sleeve looks like an old Ampex 456 tape shrunk down to fit (brings back memories).We will give it a spin and discover the birth of the classics of YesterdayAndToday. So let’s find out what is happening in the Oliver/Dawson’s Saxon School of rock this term? Graham Oliver “The band has been recording some new songs in a studio that was once owned by Gary Barlow. We have decided to do things different this time around, we are going in and laying down a few songs instead of doing the whole album in one go. It’s much heavier than our previous material. I would say it’s the heaviest thing we have ever played. It’s hard to describe maybe Ramstein meets Ozzy? BBS “They have a tentative title of Wiping Boy for the album and we are assured of an exclusive play and an interview so stay tuned for more info on the forth coming album. We are also expecting to announce a major development with the name Saxon after yet another epic struggle by Oliver to retain the use of the name. As most acts are celebrating 25 years together by reforming Saxon are drifting further apart. Graham to his credit won’t say a bad word about Bif Byford but you can see the hurt and disappointment of the whole situation. Despite all the unnecessary falling out you would put money on Oliver and Dawson re-joining Bif for a tour. Graham has so many fond memories from way back to the school days but it won’t happen unless some promoter throws a big wedge of money at it. It’s amazing how differences can be sorted when money is involved. To see the original line up back once more under the famous Eagle logo churning out “Wheels Of SteeI” would be an attraction especially if Bif drags out those white spandex again! We bid farewell to Mick from Avenger who will be playing in Germany on July 7 th and to Graham Oliver who we hope to meet up with next week for an exclusive interview. The hand shake from Dave Meniketti and confirmation of a full on interview was welcoming. As we leave Nottingham and head back home past a wooded area I’m sure we caught a glance of a shadow in the trees, was it really Robin Hood the legend dressed in green tights? Or maybe Bif has died his spandex and is waiting to shoot his poison arrow at Graham Oliver?